A solitaire aquamarine gemstone, with its icy blue color, contrasts against the yellow gold of this women's solitaire aquamarine cross pendant in 14K yellow gold from Apples of Gold Jewelry. The polished cross pendant, which measures 1.20 inches tall and 0.65 inches wide, has a genuine aquamarine gemstone set in a bezel setting. The frosty blue aquamarine stone measures 2mm in size and is AA rated. The size of the gemstone and pendant make it perfect to wear on any of your favorite chains to create a unique look that you will be proud to wear. "And Jesus came and spake unto them, saying, All power is given unto me in heaven and in earth. "(Matthew 28:18). 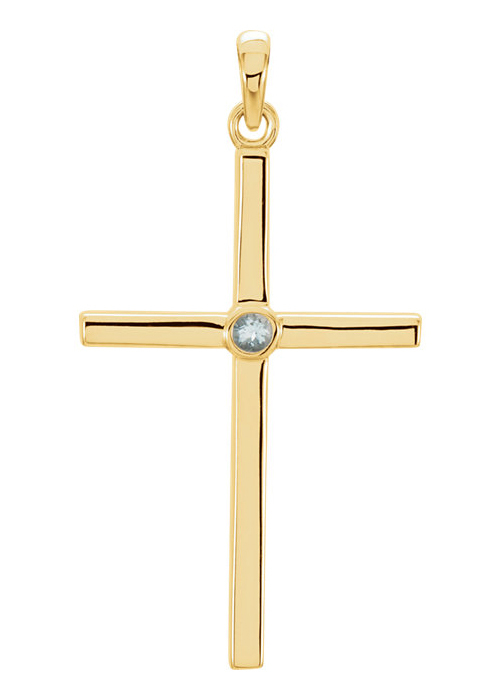 We guarantee our Solitaire Aquamarine Cross Pendant, 14K Yellow Gold to be high quality, authentic jewelry, as described above.